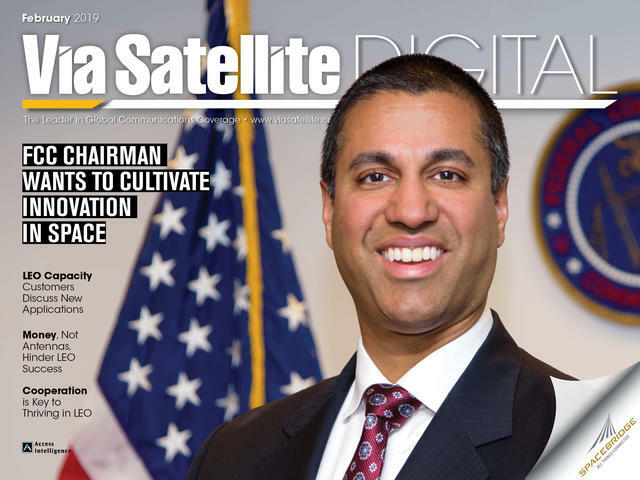 In the middle of the U.S. Federal Communications Commission’s (FCC) ambitious Space Month initiative in November, FCC Chairman Ajit Pai sat down for an interview with Via Satellite to discuss a regulatory agenda that he believes will cultivate innovation in space. “Some might say that nine space-related items on the agenda for a monthly meeting is overdoing it,” says Pai. “During Space Month, I would instead say that we have dared to boldly go where no FCC has gone before.” If you couldn’t already tell from the language in the FCC’s Space Month agenda announcement, Pai himself is a self-described “space geek.” His mission, he said, is to help the United States be a global leader in space innovation, and deliver cutting-edge applications and connectivity to American consumers on both sides of the digital divide. VIA SATELLITE: Why did you decide that November 2018 would be “Space Month” for the FCC? Pai: We realized a while ago as we were looking at a bunch of different space-related issues that were on tap — from orbital debris to addressing some of the Non-Geostationary Orbit (NGSO) constellations applications that we received to streamline various operational rules and licensing processes — that it might be a good idea to consolidate all of these things onto a single agenda. We wanted to highlight the fact that communications is becoming increasingly reliant on not just equipment and services that are here on the ground, but technology that is present up in space. So, we came up with the idea of Space Month and I have to say, I think it was a resounding success. We got all of the orders and proposals under the Space Month initiative across the finish line. VIA SATELLITE: The Space Month announcement blog post that you wrote in October doesn’t sound like it came from a typical FCC chair. 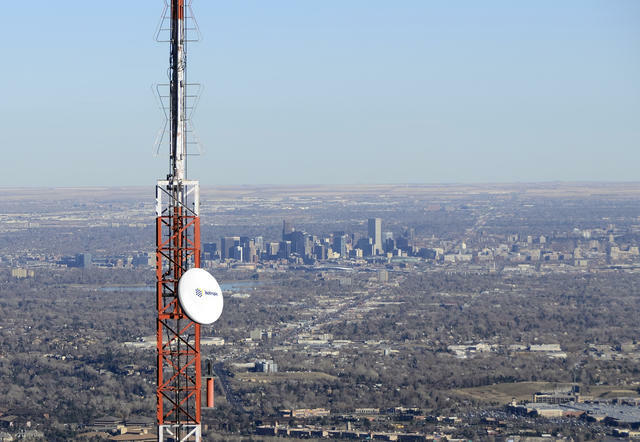 There’s a level of personal excitement about space and satellites that we don’t normally see from regulatory oversight, especially during a time when the FCC has been very involved with the U.S. wireless industry’s race to 5G. Do you view these space issues with the same level of importance? Pai: Yes, definitely! Ultimately, we want all sectors of the industry to innovate and invest and to create and deliver value to consumers. I personally believe, very strongly, that satellite has a huge role to play in the oncoming digital revolution. The Space Month project began with a conversation I had a little more than a year ago with former FCC Chairman Newton Minow. He and I were in Chicago having lunch and we were talking about his famous “Vast Wasteland” speech that he gave to U.S. broadcasters in the 1960s. The most interesting part of that conversation, to me, was him describing how he helped augur in what is considered the beginning of the U.S. commercial space industry. Chairman Minow famously believed that putting satellites into space was more important that putting a human being into space in the 20th century. He said that satellites deliver ideas that outlast the lifespan of any one human being. That’s sort of the way I see it for the 21st century. I think we’re setting the stage for the new space age. There’s no telling what kind of innovation can be realized for the benefit of American and global consumers. VIA SATELLITE: What do you find most exciting about NGSO constellation systems? Why did you highlight the Telesat, LeoSat, and SpaceX constellations in the Space Month announcement? Pai: Conceptually, we find the NGSO constellations very intriguing. Instead of sending one “bird” deep into space, you send a whole bunch of them into low- or mid-Earth orbit. It could be tremendous. 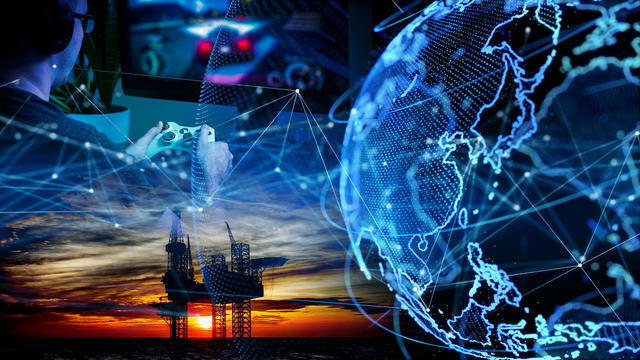 While we had about 20 applications filed by organizations looking to operate NGSO constellations, we teed up the four that we felt were the most ready for action. This assessment was based on, what I consider the heroic work of our international bureau staff. They were the unsung heroes of space month. I talked about some of them at an event in Hudson a couple of weeks ago, but the notion that Kepler has of creating an Internet of Things (IOT)-based Low Earth Orbit (LEO) business plan is very intriguing. The ideas that LeoSat has in terms of enterprise commercial-grade broadband could be a game changer for end-users in rural areas, as they’ve had quite a bit of difficulty finding these much-needed services. VIA SATELLITE: You’ve probably read more about the SpaceX Starlink system than most people in our industry. What can you tell us about it? Is it the real deal? 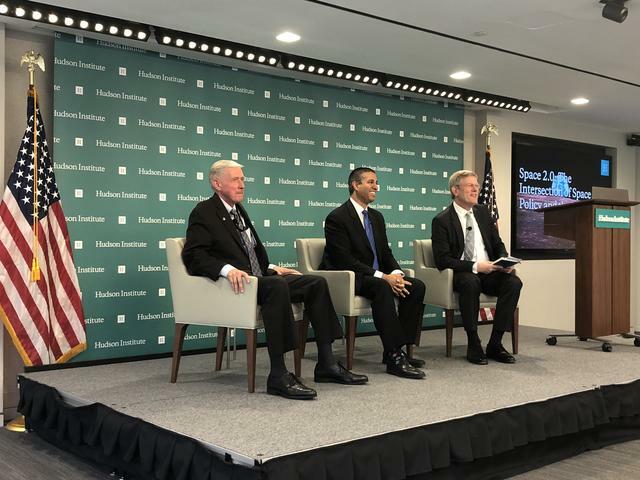 Pai: Obviously, SpaceX’s Starlink system has gained a significant amount of attention, with its ability to create a mesh network of satellites in space. The thought of Starlink being able to provide consumer-focused residential broadband speed and a price-point that is competitive with terrestrial is exciting for a lot of people. We can’t endorse any one particular business plan. But we can give all of them a fair chance to innovate and compete in the U.S. market. Our hope is that if you open up the doors to innovation, a lot of these great companies will figure out ways to make it work. VIA SATELLITE: The rise of NGSO constellations also raises orbital debris concerns. Many people in the satellite and space community believe that while streamlining regulatory processes for smallsats and NGSOs will help drive business and innovation, LEO traffic needs some sort of management system. In a perfect world, this would be a widespread international effort, with everyone chipping in to manage space traffic and sharing information. Unfortunately, it’s not a perfect world. In your mind, what’s the perfect balance of government oversight and private industry participation in maintaining a safe orbital environment? Pai: That’s a great question. We fully understand the concern for orbital debris and that’s something we want to address. With all of these NGSO constellations being launched, we’re fully aware that what goes up must, in some way, come back down. The FCC last updated its rules and regulations for orbital debris back in 2004. We understand that it’s now time for an update, considering changes in the marketplace and changes in technology. We’re working on that right now. We want everyone who is operating in orbit to be a good steward of the space that they’re occupying. We’ll be looking for entrepreneurs to take a leadership role in this area. We’re hopeful that some of the companies that are newer to the space industry will come up with creative ideas that will help us figure out the right way to mitigate some of the crashes god forbid one should happen. We don’t want what happened to Sandra Bullock and George Clooney in the movie “Gravity” to happen to anyone in the real world. VIA SATELLITE: In your statement, you state that the FCC will take up nine items to ensure that America leads in the “New Space Age.” The term “New Space” is often used to describe a wave of entrepreneurism and innovation that has inspired a lot of young people to start careers in aerospace and launch new businesses. Will your initiatives help make it easier for the New Space entrepreneurs in the U.S. to establish a footing in our industry? Do you plan to bring entrepreneurs to the table to help with orbital debris management? Pai: I’m familiar with, and very excited by, the wave of space entrepreneurship that we’re seeing in the United States. I absolutely plan on bringing young entrepreneurs to the table to solve these challenges. With regard to orbital debris, for example, we strongly urge those entrepreneurs to come to us and tell us what they’re seeing and if they have any ideas on ways that we should modify our rules to manage debris in the new space age of constellations and increased commercial space activity in LEO. It’s important for these new entrants to reach out to us. We at the FCC can’t make decisions in a vacuum. We need young people who think broadly and out-of-the-box on these issues. I’m glad to hear that there is such a concentrated ecosystem of new companies that are specifically focused on orbital debris, Space Situational Awareness (SSA), and risk mitigation. It wasn’t that long ago when this level of entrepreneurship was widely thought of as impossible. The capital you would need to invest right out of the gate was intimidating. I’m glad to see that changing. 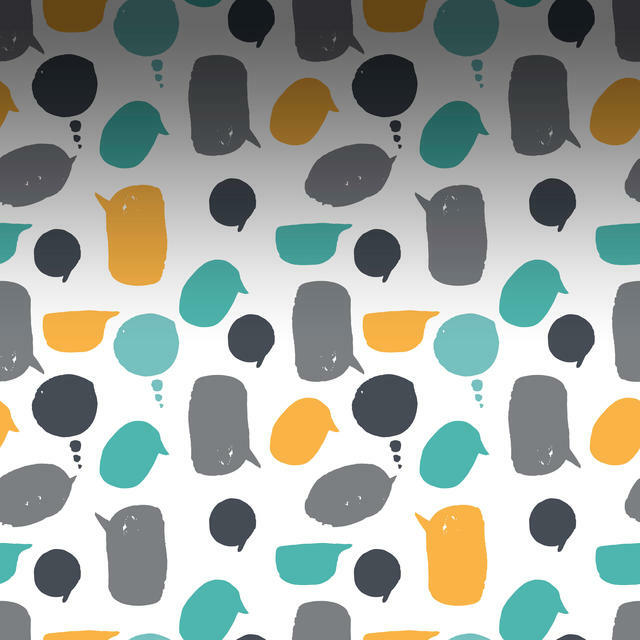 So, if you’re a young company with great ideas — please talk to us. If you’re not based in the United States, tell us how we can provide incentives to bring your ideas, skills, innovation, and jobs to the United States. VIA SATELLITE: Your list of Space Month initiatives includes Global Positioning System (GPS) enhancement for consumers and businesses, which are “using GPS for high-precision agriculture, fleet tracking, and monitoring drones.” There’s a growing space-based sensing data community in our industry that wants to provide tremendous benefits to our economy — especially with smart agriculture and fleet tracking. Are you enthusiastic about this market? How will Galileo enhance these capabilities and tools? Pai: I’m very optimistic about the future of these markets, especially considering the new consumer and business applications that are on the way. Most consumer understand GPS instinctively now, and to essentially have another system like Galileo available will create tremendous new benefits, especially on the enterprise side. Here, I think the market is just scratching the surface of what’s made possible by new innovation. I’ve spent a decent amount of time over the last year-and-a-half on farms in Maryland, Virginia, Idaho, and in several other regions in the United States. We’re seeing agriculture and technology intertwine at an increasing rate. Technology is helping farmers do what they do best, and that’s feeding America’s families. Giving farmers access to Galileo for any non-federal device could be a game-changer. VIA SATELLITE: I heard you give a speech a few months ago about how you were trying to raise awareness of new technologies that would benefit rural businesses. Does this apply to farmers and GPS, imagery, and sensing? If so, how can the FCC and other agencies, such as the U.S. Department of Transportation and the U.S. Department of Agriculture (USDA), help get these tools in the hands of businesses? Pai: Yes, and this is a good question. I’ve been working on these projects in partnership with my peers at other agencies. I’ve gotten to know Sonny Perdue [from the U.S. Secretary of Agriculture] very well, and we’re looking at ways of collaborating. I’m also working with the Veterans Affairs department on telemedicine projects. We’re always looking for opportunities for us to work with other federal agencies to help spread the word about new technologies for farmers. They’re very busy people, and the FCC will prioritize anything we can do to help their farms and businesses thrive. VIA SATELLITE: Let’s talk about mobile satellite connectivity. Specifically, your work in updating regulations for Earth Stations in Motion (ESIMs). How did GEO satellite operators respond to your changes to ESIM rules in September? Pai: The GEO operators responded very favorably. I think a lot of them are interested in providing better connectivity to some of these Earth stations that are always in motion and I think they obviously see and understand the market opportunities in connecting moving vehicles on land, sea, and in the air. Increasingly, the future that we see in regards to what the American consumers want is to be connected wherever they are. GEO operators present a unique value proposition in providing that connectivity. Hopefully, our recent decision will enhance their ability to deliver. 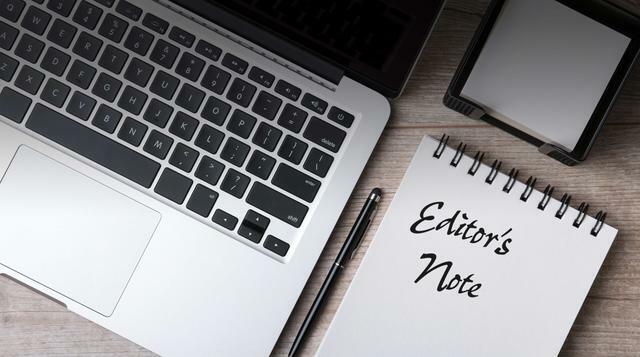 VIA SATELLITE: Do you think expanding these rule-changes to NGSOs will open the door to seamless networks for connected vehicles? Pai: Having completed the rule change for operators in GEO, we obviously wanted to follow that up by providing the same opportunity to NGSOs. They’re an important part of the market with their own unique value propositions. Here too, we’re hopeful that the NGSO operators will be better suited to provide their unique value following our rule changes. I can tell you this in particular; I see GEO and NGSO systems playing a critical role in rural and remote connectivity. This is something that really matters to us. A couple of months ago, I was in Moab, Utah doing a videoconference with the superintendent of the Kane County School District in the southern part of the state. We were talking about some of the disadvantages that kids from remote, rural regions face when going to school. These kids have long, multi-hour bus rides to and from school. During these long trips, the kids are hopeful that they can do their homework, take a test over email, and use all of the internet-connected tools that other kids in the United States have at their disposal. And, they can’t do that because service isn’t available. This isn’t a small group of kids. There are thousands and thousands of these kids who are cut off from connectivity for hours every day because they are not in a fixed location. I think opening up ESIMs to different types of innovators will help a lot of students, and everyone who is on-the-go in rural America, improve their lives. VIA SATELLITE: Are satellite systems the best solution to bridge the digital divide in the United States? Pai: This is why I’m generally very bullish on satellite. It doesn’t matter where you are. You can be at the top of a mountain or at the bottom of a valley. The topography of the Earth doesn’t matter to a satellite, whereas it creates significant challenges for fiber operators. Satellites have very special properties within the broadband marketplace. I hope that satellite operators and service providers are encouraged by what we’ve done with Space Month and some of our other initiatives. VIA SATELLITE: U.S. government funded-broadband stimulus programs, including those designed to close the digital divide, haven’t always worked out well for satellite operators in the past. Now that the FCC is under your direction, are you taking a more inclusive approach to satellite communications? Pai: Yes. When we established the Connect America Fund [also known as the Universal Service High-Cost program] in 2017, we made sure we brought satellite into the equation so that they could compete for federal funding. We wanted to make sure that they understood that they are very much on the FCC’s radar in a very substantial way. At the end of the day, satellite services are extremely beneficial to consumers, especially in rural areas. VIA SATELLITE: In addition to remote connectivity, the satellite industry would also like to be included in the race to 5G wireless rollout. It’s fair to say that maintaining leadership in a 5G race against China, which doesn’t have the same legal and regulatory hurdles to clear, is going to be a difficult task for the United States. 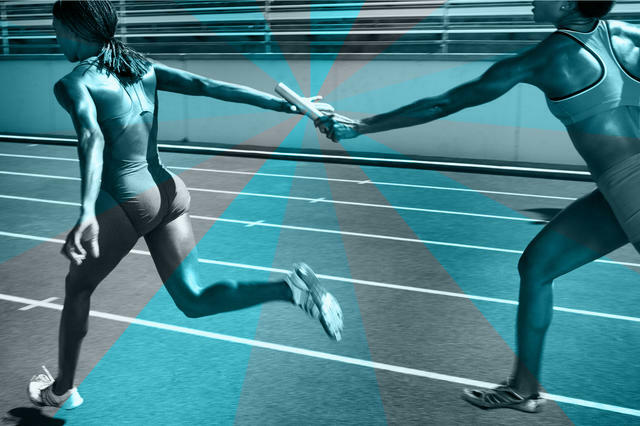 What’s our stake in winning that race? 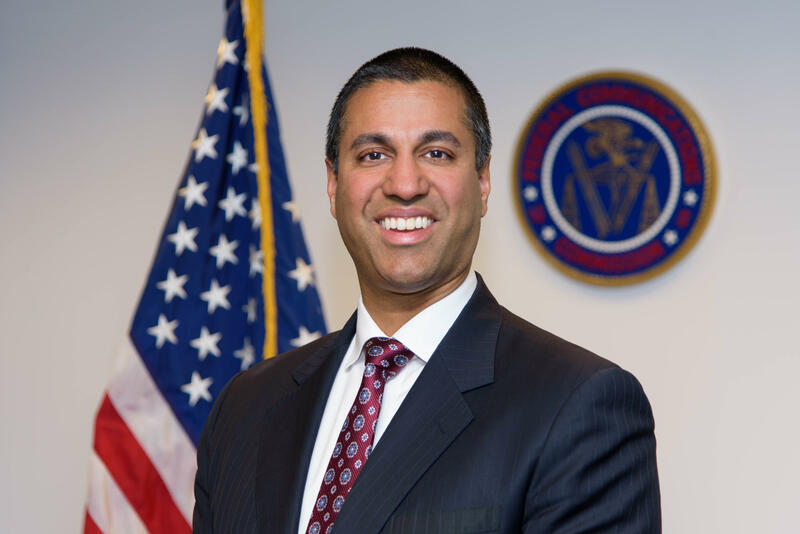 Pai: First, let me say that I think it’s important that the entire telecommunications industry unites to help us tell the story about how 5G will benefit everyone in this country. The public’s eyes tend to glaze over all the acronyms and particular terms and technologies that we use. They’re not really that interested in how small cells work and how spectrum fits into everything. If, however, you explain to average consumer that it’s important for the United States to lead in 5G because of the enabled technologies — 100-times faster speeds, the ability to launch new businesses, provide cutting-edge tools to schools and students, drive the new economy—– then, you start to build public support, which puts pressure on us to adapt and create sensible regulatory policy to make 5G happen. One of the main reasons we want to win the race to 5G is to keep talent and capital in the United States. Talent and capital are fickle by nature. They will ultimately go to any country or company where they feel appreciated and where there is opportunity to create. That doesn’t necessarily have to be the United States. We were very fortunate to lead the world during the 4G and 4G LTE transition. At the time, we had 4 percent of the world’s population and 50 percent of the world’s 4G LTE subscriptions. Other countries saw that success and now want to replicate it for themselves. If we’re competing against China’s strong national 5G policy that helps clear out spectrum and roll out infrastructure very quickly, eventually, those with talent and capital will take notice and start to gravitate toward that market as a test bed for innovation. VIA SATELLITE: Considering everything you’ve said about satellites, do you feel that satellite operators can contribute more than just bandwidth to the 5G cause? Pai: Just as we want the United States to maintain leadership in 5G, I also want the FCC to be technologically neutral. 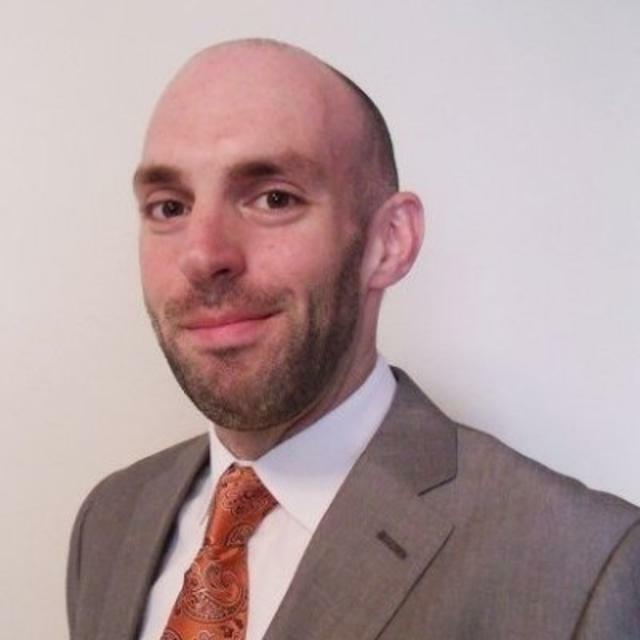 In regards to my working relationship with satellite operators, and the C-band alliance, and the Satellite Industry Association (SIA), I think it’s very good. We have an open rule-making process right now on C-band, in particular 3.7 to 4.2 GHz. When I spoke to SIA earlier in 2018, we outlined all of the steps that we would take in working together to enable 5G with fair spectrum policy. There’s a real synergy between the SIA and the FCC. In terms of 5G leadership, our priorities are the same. I think the working relationship has been productive. I hope they see it that way. I want them to know that we don’t put our thumb on the scale for any industry, or go out of our way to slight any industry. I would very much like to continue working with our satellite partners moving forward. Satellites are too important to the overall 5G equation to be left out. The innovation and engineering knowledge that comes from the satellite industry is incredible. Reading about what modern satellites are capable of makes me wish I continued learning about physics beyond high school. VIA SATELLITE: If you want a long list of acronyms to glaze over, you should ask a satellite engineer. Pai: I know! I was touring SpaceX’s facility recently and their team was trying to explain to me all of the engineering and aeronautics. Every tenth word was an acronym. I tried my best to keep up. I hope they weren’t getting tired of me asking what each of those acronyms meant. Thank goodness I had Gwynne Shotwell — who is amazing — on hand to explain these advanced concepts to a layman. It’s amazing to think about all of the legwork that goes into space technology work. I really admire and appreciate the very smart and talented men and women of the space industry. VIA SATELLITE: Did you just tour the SpaceX facility? Or, did you also get to see a satellite launch?